A newly released report details how BCD Travel reduced its environmental footprint, improved corporate health and safety, engaged in more sustainably focused supplier partnerships, and enhanced its ethical conduct controls. The list of achievements led to BCD becoming the first travel management company to earn an EcoVadis’ gold rating for sustainability. BCD’s 2017 Corporate Social Responsibility Report charts the company’s CSR journey and recent successes. It also serves as BCD’s annual Communication on Progress to the United Nations. 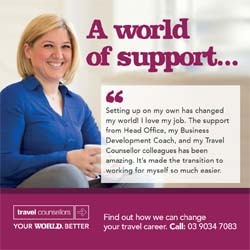 In 2008, BCD Travel was the first travel management company to join the United Nations Global Compact. With more than 8,000 participating companies from more than 160 countries, the Global Compact consists of 10 principles in the four areas of human rights, labor standards, the environment, and anti-corruption with which companies should rigorously comply. BCD also adheres to GRI G4 core guidelines, an internationally recognized reporting standard that enables businesses to communicate the sustainability-related impact of their operations. The company has formalized its CSR practices and objectives, incorporating them into broader business goals defined by its corporate strategic direction. The report shares specific progress in BCD’s focus areas, which include: governance & business ethics, health & safety, environment, supplier sustainability, service performance, global energy saving program and workplace practices. BCD Travel’s sustainability efforts were awarded the gold rating from EcoVadis, a CSR rating firm whose assessments are recognized and sought by companies across the globe. BCD’s EcoVadis gold rating places the company in the top 1% of all suppliers assessed in its industry category and the top 2% of all suppliers assessed by EcoVadis. Travel Magazine, a leading European travel trade publication, honored BCD with the title of “Best Business Travel Agency 2016” in Belgium and Luxembourg. In addition, they awarded BCD with the Innovation Award for its entry on the TripSource Hotels application.